An opened can of sardines on a table. Sardines most often are available canned in oil, water or a flavored sauce, such as tomato or mustard sauce. You can eat these small fish on their own, or use them in pasta dishes, dips, salads and casseroles. These highly nutritious fish can be a regular component of an overall balanced diet. A 3-ounce serving of sardines contains 21 grams of protein, or 42 percent of the daily value for protein based on a 2,000-calorie diet . Protein is an essential nutrient for building and repairing muscles and other tissues, and allowing your body to create certain hormones. Protein can also help maintain more stable blood sugar levels and delay the onset of hunger after a meal, according to Harvard University. Sardines are carbohydrate-free. Eicosapentaenoic acid, or EPA, and docosahexaenoic acid, or DHA, are omega-3 fatty acids found in fish. Omega-3 fats may help lower your risk for heart disease when you consume at least 250 milligrams per day, according to the 2010 Dietary Guidelines. A 3-ounce serving of sardines provides 40 milligrams of EPA and 43 milligrams of DHA. Sardines and other fatty fish are the dietary sources with the greatest concentration of EPA and DHA. Each 3-ounce serving of sardines provides 325 milligrams of calcium, or 33 percent of the daily value based on a 2,000-calorie diet. Calcium is an essential mineral for building and maintaining strong bones, and canned bony fish, such as sardines, are non-dairy sources of calcium. Sardines are also a good source of vitamin D, which helps your body use and absorb calcium. 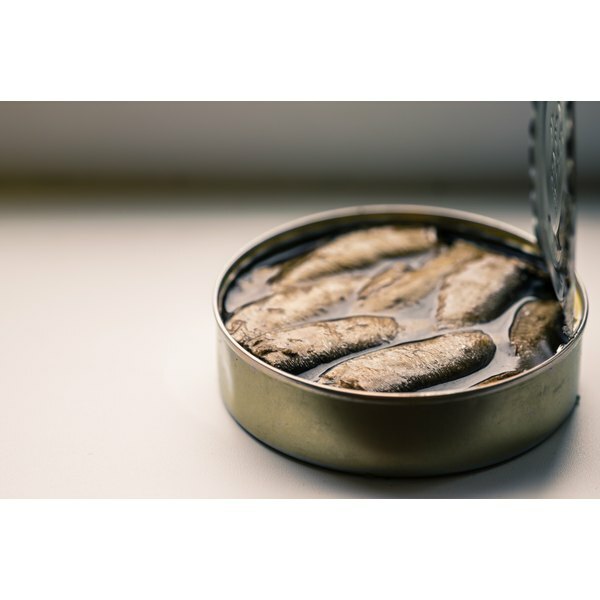 Drink a glass of fortified skim milk with your sardines to get extra calcium and vitamin D.
A 3-ounce serving of canned sardines in oil contains 261 milligrams of sodium. Sodium is an essential mineral for fluid balance in your body, but excessive sodium in your diet can lead to high blood pressure and a higher risk for stroke, heart disease and kidney disease Healthy adults should limit daily sodium intake to a maximum of 2,300 milligrams per day. Rinse your sardines before using them to reduce your sodium consumption.